Osprey Lodge provides care and support to those individuals experiencing a serious mental illness with a focus on maintaining or increasing their ability to care for themselves, wellness planning, skill building, placement, and follow up. A person directed approach allows patients to regain control of their lives as partners in an interprofessional team. Interventions aim to increase wellness and autonomy, to develop essential life skills, and supports to ensure a successful discharge. The purpose of this program is to verify their true level of independence and identify the challenges that have limited successful transition into the community by reducing mental health and behavioural challenges, regaining skills, and returning the patient to the community. 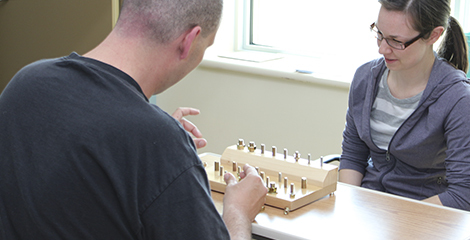 Therapeutic activities are centred on social reintegration, carried out in and out of hospital. Following discharge, consultative services and time-limited follow up are provided by the Community Outreach Service of the Psychiatric Rehabilitation and Recovery Program. Outreach services provide support to patient, family and community resources during the transition to community living after discharge. Education and skill development provided to patients, families and community. Integration and development of the necessary community resources, to ensure successful community living while optimizing individual strengths of the patient.